Thanks for visiting the website for Taiwanese Chamber of Commerce of Greater Georgia (aka Taiwanese Chamber of Commerce of Gainesville Georgia). TCCGG, since its inception in 2014, has served the Taiwanese-American business community in Northern part of Georgia. TCCGG has served as a bridge between the business community in Taiwan and the business community in Georgia and promoted a greater exchange between these two vibrant business communities. Besides focusing on the promotion of business cooperation between the business communities of these two regions, TCCGG has also promoted cultural exchanges between the people located thousands miles apart. 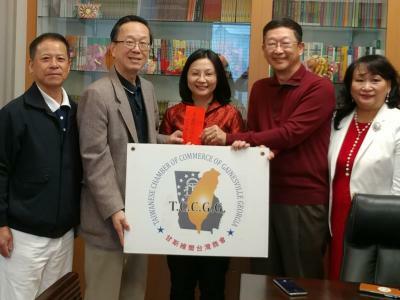 TCCGG has always served as a good source of information and assistance for the business in Georgia who look to expand their business not only into Taiwan but into Asia in general. TCCGG’s board members have diverse business experience and they are willing to share their experience in cross-culture, cross-border trades. Please feel free to contact me if TCCGG can be of assistance to you. 照片 : 從左至右, 李德貞理事, 王立綱會長, 傅主任, 郝慰國副會長, 及陳家琪理事. President 2014/ Chang, Sung H.
Aug. 16 2014 / Read more! Sep. 05 2014 / Read more! Oct. 25 2014 / Read more! Nov. 16 2014 / Read more! Nov. 09 2014 / Read more! Dec. 05 2014 / Read more! Dec. 20 2014 / Read more! Dec. 31 2014 / Read more! Jan. 30 2015 / Read more! Mar. 28 2015 / Read more! Apr. 06 2015 / Read more! Apr. 07 2015 / Read more! Apr. 15 2015 / Read more! May 03 2015 / Read more! May 16 2015 / Read more! May 17 2015 / Read more! May 20 2015 / Read more! Jun. 09 2015 / Read more! Oct. 31 2015 / Read more! Feb. 18 2016 / Read more! Feb. 23 2016 / Read more! Apr. 30 2016 / Read more! Jun. 04 2016 / Read more! Jul. 12 2016 / Read more! Aug. 13 2016 / Read more! Sep. 19 2016 / Read more! Aug. 12 2017 / Read more! Sep. 23 2017 / Read more! Jan. 26 2018 / Read more! Feb. 17 2018 / Read more! Apr. 20 2018 / Read more! 六月十六日 星期六, 天氣晴朗, 甘斯維爾台灣商會和客家同鄉會在Pinknyville Park一起舉辦了端午節野餐. Jun. 16 2018 / Read more!